Have you ever wondered how artists work? From the conversations I’ve had and the observations I’ve made it seems that experimentation is to be at the forefront of many’s processes, with ‘mistakes’ and happy accidents leading to some of their best works. 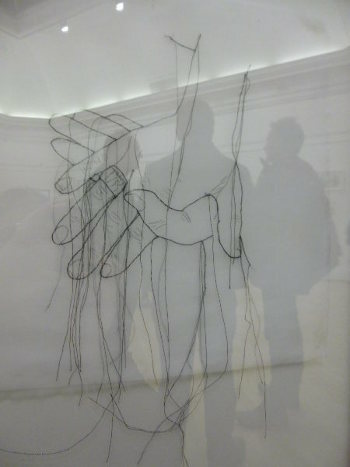 Last week I attended the exhibition launch of Drawn at the RWA (a fabulous exhibition full of works using and interpreting drawing in an astonishing variety of ways), and fell in love with a triptych of works by Susi Bancroft titled Handwashing in Hospital, and using a mixture of drawing and free machine sewing. They’re filled with a sense of movement, even haste, and I crouched down to take a photo (flash off, and with permission, natch). What I hadn’t considered were the crowds milling through the room, who’s silhouettes showed up on the crisp white background as I snapped it. When I realised what I captured, it made me smile. Purely by accident, I’d taken an artist’s work of art and added a new dimension to it. Tahdah! Perhaps the shadows imprinted on the scene offer a sense of the people waiting to be looked after in the hospital. I’m not suggesting you take others’ work and subvert it too your own ends. My point is that accidents happen, and can be embraced. A misspelling that tweaks the meaning of a sentence, a spill of ink that changes the shape of a drawn tree into a possible monster in your artwork. Embody printmakerJulie Paterson’s Imperfect manifesto – don’t delete your mistakes or cast them aside too quickly, take a moment to consider whether they add something to the work you hadn’t anticipated. You might find yourself wanting to welcome them in. Drawn will be at the RWA in Bristol until 7th June 2015. This entry was posted in Writing prompts and tagged art, inspiration for writers, RWA, story ideas, writing inspiration by Judy. Bookmark the permalink.